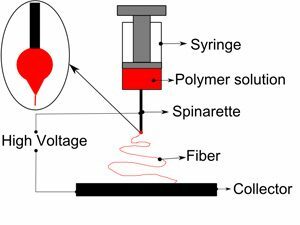 Electrospinning represents an almost classic method of fabricating ultra fine polymer fibers. The idea of electrostatically spinning polymer ultrathin fibers is around since more than 70 years. A polymer solution is fed through a small opening, usually a syringe needle or a pipette, at its end a small droplet of polymer solution being formed. A high voltage is applied between the polymer solution feed and a collecting electrode. Under the influence of the electric field the droplet deforms, a so called Taylor cone being formed. 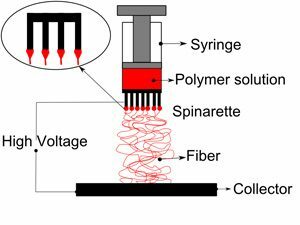 Further increase of the applied voltage leads to either spinning of a polymer fiber from the Taylor cone towards the collecting electrode or to spraying of polymer droplets, processes known as electrospinning or electrospraying respectively. Experimental parameters such as sollution composition and viscosity, spinarette to collector distance and applied voltage control the process. The method of electrospinning has numerous advantages. Properties of the fibers can be well controlled. The fibers are very thin and have a high length to diameter ratio, thereby providing a very large surface area per mass unit. A wide range of polymers can be processed in this manner including here natural polymers such as collagen, fibrinogen or polysaccharides. Is a method that allows one to deposit very thin polymer fibers, diameter down to few tens of nanometers. Although the process is studied since long time ago, a scan through recent scientific literature presents the main shortcoming of the method, the low yield in terms of quantity of material produced. Consequently, the consortium approaches a problem of high technical and scientific interest, namely to develop an alternative of the method in order to increase the efficiency of nanofiber fabrication through. We aim at replacing the classic syringe needle, pipette or other capillary with an array of metallic micrometer or submicrometer tubules prepared by a template approach. The main objective of the project is to develop a highly efficient alternative of the electrospinning method for preparing polymer nanofibers. The fabrication process we will develop aims at using, instead of the classical spinnerets (syringes and pipettes), arrays of metallic micronic and submicronic tubules. Secondary objectives will be the fabrication of functional metallic fibers and of products based on it for shielding applications and of complex fibers and fabrics for photovoltaic applications. The outstanding properties of electrospun nanofibers make them optimal candidates for a broad range of applications in widely different areas such as protective clothing, filtration, high surface electrodes, catalysts and catalyst supports drug delivery substrates and so on. The consortium represents a mixture between different type of research institutions, namely 2 National Institutes and 2 Universities and a private owned company with its activity focused on textile products, clothing and protective equipment. The aim of the consortium is to develop a new technology for increasing both the efficiency and the parameter control of an industrial process and to apply the technology for different products.